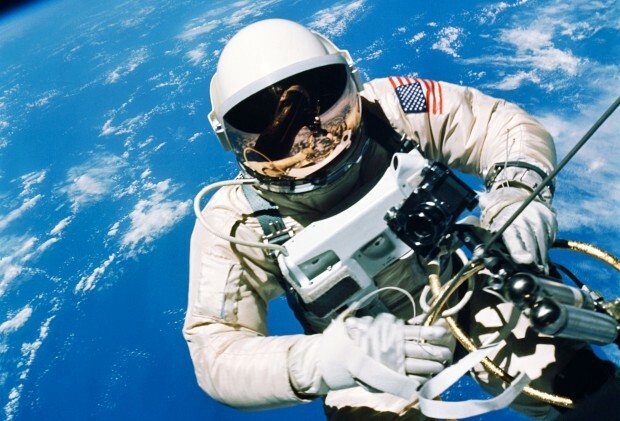 This week (3 June 2015) is the 50th anniversary of the first NASA spacewalk. Edward H. White II floated for more than 20 minutes in the microgravity of space on the Gemini IV mission in 1965. Since Edward H. White’s spacewalk, NASA astronauts have performed spacewalks on the Gemini, Apollo, Skylab, Space Shuttle and ISS programmes. The first spacewalk (officially known as an extravehicular activity, EVA) was performed by Soviet cosmonaut Alexei Leonov (18 March 1965) during the Voskhod 2 mission. EVA became a skill that allowed Apollo astronauts to explore the Moon’s surface, service the Hubble Telescope and build and service the International Space Station (ISS). The UK has been investing in the ISS and its related ELIPS programme since the 2012 ESA Ministerial where the UK pledged £16 million to the ISS and £12.4 million to ELIPS. In the recent 2014 ESA Ministerial, we invested a further £49.2 million in the International Space Station programme. British ESA astronaut Tim Peake will be joining the ISS in November this year (2015) with the possibility of doing a spacewalk during his mission. To train for EVAs, astronauts use neutral buoyancy (weightlessness simulated in a large tank of water). A neutrally buoyant object neither floats nor sinks. For an astronaut to be neutrally buoyant in the water, the natural tendency to float or sink is counteracted by weights or flotation devices. By doing this, the astronaut can feel the pull of gravity and the drag of moving through water slows down their movements. This is the closest we can get to microgravity on Earth. Full EVA training is done at NASA’s Neutral Buoyancy Laboratory (NBL) in Houston, Texas and the Gagarin Cosmonaut Training Centre in Russia. Before undertaking EVA training in the US or Russia, European astronauts undergo EVA pre-familiarisation training at the European Astronaut Centre (EAC) in Cologne. This programme teaches ESA astronauts basic EVA concepts and EVA skills such as tethering to the Station, use of special EVA tools, communication with an EVA crewmate as well as with the control room and how to keep full situational awareness in a complex and challenging environment.